The problem isn’t partisanship; it’s the party that doesn’t believe in providing Americans with health care. Monday night, Jimmy Kimmel offered a moving account of his newborn son’s battle with heart trouble. It was surprising to see the late-night host so serious—he began crying several times during the powerful description of his son’s struggles—though thankfully the story had a happy ending, with young Billy receiving successful open-heart surgery. 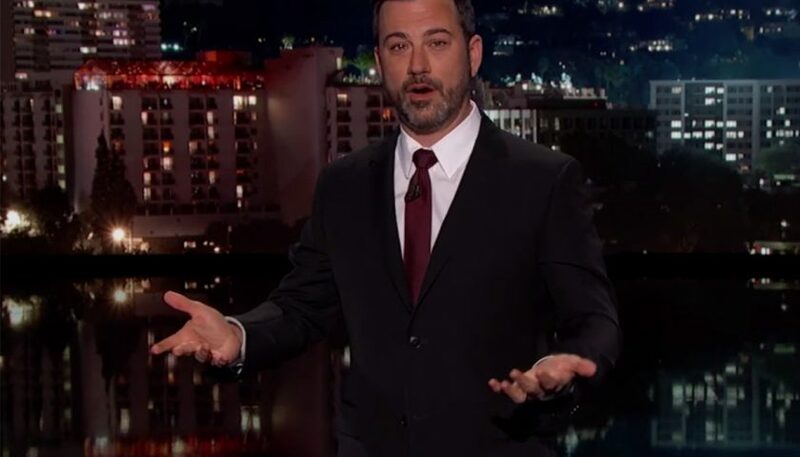 Kimmel concluded the story by making an ostensibly political point, taking several minutes to preach his opinion that all Americans with pre-existing conditions should have proper health coverage. Kimmel’s plea was in one sense lovely, and I’m glad he made it. It’s an issue that deserves attention, and it’s possible that his monologue, which quickly went viral, will have a positive effect. (“Jimmy Kimmel Might Have Struck the Final Blow Against the GOP Health-Care Plan” suggests the perhaps overly optimistic title of a post on New York’s site Tuesday morning.) But Kimmel’s essentially nonpartisan analysis of the health care debate perfectly underlined the misguided way in which too many Americans view politics. Note that Kimmel laid the blame for this “nonsense” at the feet of “partisan squabbles.” In his telling, the fault lies not with one of the “teams” but with the games they play in Washington, at the expense of the rest of us. But this is an untenable analysis of the political present. Kimmel might have paused to ask exactly why the positive change in health care reform that he described occurred in 2014. If he had, he might have noticed that it was the result of another “partisan squabble”—i.e., a bill that the Democratic Party had pushed and passed and that the entire Republican Party had made it their singular mission to oppose. Now, with a new House bill on the verge of possibly being voted on, the parties are once again divided, with the entire Democratic Party lining up against a bill that would very likely do great harm to people with pre-existing conditions, leaving them with coverage gaps and high premiums. About 85 percent of House Republicans support this bill, as does the Republican president. Despite his promise to care for people with pre-existing conditions, Trump quite clearly knows as much about the bill he backs as he does about the Andrew Jackson presidency, which is to say very little. I’m glad Kimmel believes that all decent people want to cover pre-existing conditions. I’d like to believe that, too. But a good chunk of America just voted for a president and a party that do not care at all about providing health insurance for needy Americans, whether or not their medical problems are pre-existing. Those Americans chose that “team.” Kimmel seemed to briefly acknowledge this fact during another, better part of his monologue, when he rebuked President Trump, by name, for proposing a cut to the National Institutes of Health. On the issue of health care, however, Kimmel was determined to blame the system. But the problem in Washington is not partisanship per se. It’s an ideologically deranged party and its know-nothing leader in the White House. The fact that approximately half the voters in this country support that party is a much less comforting thought than the one about America coming together to care for kids like Billy. Until we face up to that pre-existing reality, we don’t have any chance of ensuring that we live in a society that truly cares for its most vulnerable citizens.